What does the feedback look like? The color of the feedback is an initial indicator of how the feedback turned out. 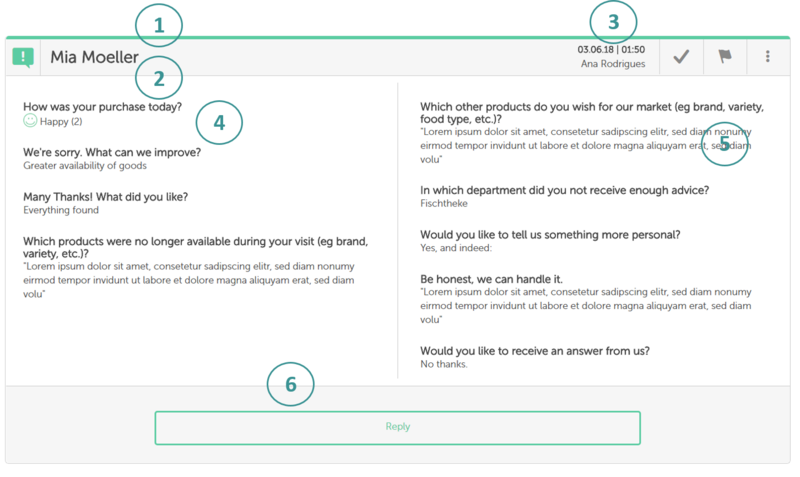 If you include smileys or star questions in your feedback form, the system calculates the average of the submitted reviews and immediately gives you a quick overview of whether the feedback was good or not. The colors are based on the traffic light system – red, orange, and green (1). The “Anonymous” is always replaced by the respondent’s name if you use the first name and last name elements and if these are filled (2). The date, time, and location/feedback form for which the feedback was intended are displayed in the header on the top-right. The icons with which you can edit your feedback are also displayed here (3). In addition to context information (4), such as which Honestly software terminal, mobile website, or language was used, you can also view how a respondent answered your questions (5). In case he/she also left his/her email address, you can send a direct reply by simply clicking on the “Reply” button (6). How do I process my feedback? How is feedback uploaded and how will i receive it?